Generates rainbow colored glows based on the distances from the edges of the source input. Any edges in the input image, where the brightness crosses the given threshold value, will generate an equal glow into the darker side of the edges. 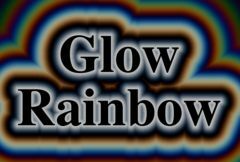 This is similar to GlowRainbow but here the glow colors are also scaled by the Mask input, and also the source and background can be different clips. Back: The clip to combine the glows with. Matte: Optional. Specifies the opacities of the Front clip. These values are scaled by the Source Opacity parameter before being used. Glow Under Src: Default: 0, Range: 0 to 1, Shared . Glow From Matte: Default: 0, Range: 0 to 1, Shared . Light Back: Default: 0, Range: 0 to 1, Shared .